Ecommerce has become an integral part of the today’s society. However, the hysteria that greeted its rapid rise not only in Africa, but in Nigeria, has to a large extent cooled off. Household brands like Jumia, Konga, Dealdey and HotelsNg continue to mirror the significant gains from the upsurge and the progress made over the past couple of years. Household issues like trust and technological limitations have also made it difficult for many startups to make significant inroads into a sector, deemed to be climaxing in terms of opportunities offered to new entrants. But some new entrants aren’t bound by this narrative, and are uncovering opportunities with lucrative potential. Shoepify is one of those. Launched in September 2016, the online retail store has cornered a niche for itself and is so far proving extremely lucrative. By offering largely quality shoe products at a relatively low cost, it is managing to capture an attractive number of cost-driven online shoppers who prioritize cost whenever making shopping decisions. In this interview, the founder of Shoepify, KOLAWOLE OMOWUNMI (A 26years old political science graduate from University of Lagos) share more on the inspiration behind the brand and why she believes it’ll blossom into a household name. What was your motivation for being an entrepreneur? Apart from the fact that I hate waking up by 5am and routines bore me out,lol I like to be in control of how things work & I call the shots, and there’s no way my dreams are coming alive without it. So here I am. Also, I like taking risks, and solving problems. Were you always certain the entrepreneurial was for you? I knew that 9-5 wasn’t for me. And the problems I was looking to solve would’nt be solved that way. Though I had to pay my dues. I worked 9-5 before I started my own businesses. I had to understudy at a couple of companies. I worked with a start up, a Medium enterprise and a Large organization. I was able to see how things worked first hand and how they faired in structured environment.I’m an experienced Customer Management Personnel. What’s the story behind the Shoepify brand name? What sectors are you predominantly focused on housing products from, and why? Personally, I have other things going on. Also, I’m focusing on wardrobe essentials for stylish women-when you think of one, think about everything she needs. That’s where we are going. Nothing in the works for guys? That’s something we will do in future. But for now, NO. You seem to have launched right in the thick of Nigeria’s current economic crisis. Did this in anyway influence the brand strategy in terms of retailing largely low-cost products? Oh yes you can say that You can also say that’s Our Unique selling point. I believe 2 important things are involved when starting a business. A lot of people are doing what you do but how do you convince the consumers to choose you instead of them? Is it with products or services? I thought that a lot of women love to look good and in a country where everything is on the rise apart from wages, there is a need for a brand that doesn’t let you break the bank. So, a solution was provided. If managing a business during an economic crisis is usually a struggle, then starting out should feel like hell. Has this been the case for Shoepify Market, and why? Currently, what would you consider your greatest daily challenge(s) in managing shoepify? The general fear of internet scam which can be divided into two. Apparently quite a no of people have been victims of fraudsters on Social Media, especially instagram that pose as actual stores, display items and make promises to the consumers then disappear with the money after payment is made. Another one is the authenticity challenge which was anticipated. We are quite affordable so we understand when consumers have ask questions regarding the authenticity of our items. What measures do you put in place from a strategic point to address these challenges? The e-commerce wave that stormed Nigeria, and Africa as whole, just a few years ago seem to have cooled off. Do you think this is accurate and if so what can you attribute this to? I think that the common factor of ‘initial gragra’ (excuse my language) played out here We gave witnessed time over time how Someone starts a business or something new and suddenly, everyone is going into it Without proper research or a plan to modify things, Also, a lot of Nigerians still prefer the traditional ways of shopping because we generally have trust issues- we’d rather go into a store. What key trends do you expect to see in the e-commerce sector in the coming years? We need a lot of more reliable platforms and integrity based businesses because it’s almost becoming a trend for all business to bend to the Nigerian ways if doing things no matter how good or efficient they were before. Sort of like an unspoken rule Which I think is as a result of the people generally letting things go So when a company doesn’t keep their words we attribute it to ‘the Nigerian way. How is shoepify Market strategically positioning itself to push beyond the limits of the sector? What do you think the coming years hold in store for this brand? Lool please not now ?? This is good. With effort and of course ”Gods grace” shoepify will be the talk of town soon. Yes, thanks a lot ?? 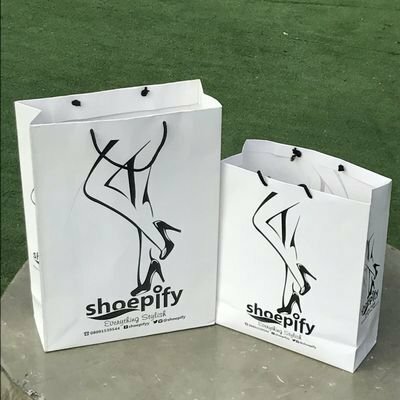 I really love what you are doing with Shoepify. Thanks a lot Viv ?? Hian. Nothing for men. I’m angry. On behalf of all men. We demand that you branch out into men shoes. And call it Menification or something. OK OK Thank you sir ? Harry, thank you so much ?? Hey! U’re doing a good job, I know u can achieve anything you set your mind on, this is only the beginning. Go girl, I’m rooting for you. Nice interview btw. Thank you for being a support since day one. This is such an interesting piece. The questions, the answers and the way it was structured very great. I have to check out the shoepify brand. I am a fashion designer but I’ve learned one or two things from this.